Home / WordPress Themes / Blog WordPress Themes / Beauty Hair - Responsive Ecommerce WordPress Theme for Hair and Beauty Salon. 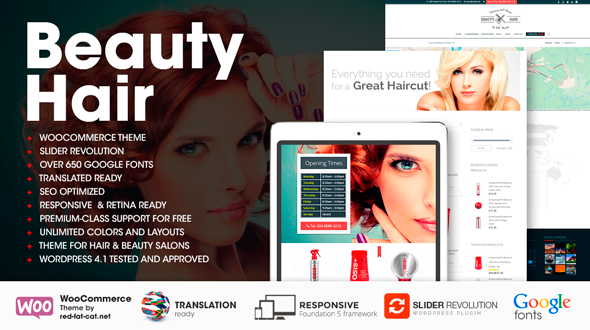 Beauty Hair – Responsive Ecommerce WordPress Theme for Hair and Beauty Salon. Beauty Hair is a premium WordPress Theme, suitable for hair salons, beauty salons and hairdresser. Beauty Hair is a Parallax eCommerce WordPress theme inspired by modern eCommerce designs. Beauty Hair built on a very powerful and flexible Foundation 5 framework by ZURB and is designed with content flexibility and intuitive features in mind. Use these great core features to grow your business. It is very easy to setup and use. Our theme has parallax and slider sections so your content will always look beautiful! This theme comes with a very powerful admin panel. You can control almost every element colour via this panel. Search Engine Optimized – Beauty Hair theme is written keeping in mind your sites good ranking on search engines. The theme has good use of h1, h2, h3, h4 tags. The primary contents are above the secondary contents in markup. Beauty Hair its a powerful WooCommerce theme that will give you and your customers a smooth shopping experience which can be used for various kinds of stores. All page layouts work perfectly on all devices, from large monitors to smartphone’s. Our theme is translation-ready. You can translate it to any language as well as set it up for multiple languages. It includes a .POT file that is used to create .po/.mo files in the language you need. Need an online shop? We’ve got you covered! Popular WooCommerce plugin pays nicely with the Beauty Hair, so you can start selling right away! With Beauty Hear, nothing but the latest features of WordPress are used. Beauty Hair looks great on any device, from mobile to desktop and beyond. Full Color Customizations – change every element! To make your start easy as possible we have included the demo content from our showcase site to help get things going. Easily use images, patterns and colorson the site. Beauty Hair is translation ready with the included .pot language file. If you need even more customizations, you can easily add custom CSS directly from our theme options panel without editing core theme files. Those styles will overwrite the theme styles and will not be lost when upgrading the theme. Beauty Hair is ready to help you get higher rankings because we have built it with SEO best practices in mind. Beauty Hair uses semantical valid HTML code and CSS which allows search engines to easily index the content of your site. Premium support and free updates. When you purchase a copy of Beauty Hair you gain access to 5 star customer support and free updates. You can easily switch fonts for all text elements using our Options panel. Ultra Responsive – Beauty Hair is 100% responsive, each and every element including the awesome slider are fully responsive. This theme comes with an extensive help file that explains how to set up every aspect of the theme. Beauty Hair is a fully responsive shopping theme built with WordPress and woocommerce. Translation ready! Includes the .pot file. Custom Backgrounds – Beauty Hair allows you to set a custom background. A super-quick way to get creative with your site. Profiles for Facebook, Twitter, Google+, LinkedIn, Foursquare, YouTube, Vimeo, Instagram, Pinterest, Dribbble, Behance, Tumblr, RSS etc. Beauty Hair is ready to use from the box. Quickly install it via FTP or WordPress and after you activate it you can load demo content. Then you can add your own content on already designed pages. The sample images viewed in the live preview are for demo purposes only and are not included with your purchase. The current version is 1.0.6: Released on August 26th, 2015.